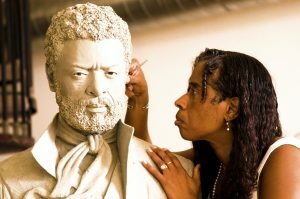 Enslaved Africans’ Rain Garden, Inc., will be hosting an exhibition for the preview of the two-of-five life-sized bronze sculptures for a yet-to-be-built urban-heritage sculpture garden at an exhibition at the Yonkers Riverfront Library. The exhibition will be on view through 2019, when all of the sculptures are completed. Justice of the United States Supreme Court. Hon. Patricia McDow, former Yonkers City-Council Majority Leader, brought the story of the enslaved Africans at Philipse Manor Hall to Vinnie Bagwell’s attention in 2009, which sparked the idea of creating a public-art initiative to honor enslaved Africans.